HANOI – Thanks to cheap labor costs, preferential tax and investment policies, and its geographically strategic location, Vietnam is fast becoming the go-to destination for multinational technology companies’ manufacturing and assembly needs. Samsung, which is opening a new $3.2 billion complex in Thai Nguyen and expanding its Bac Ninh facilities for a total investment of US$2.5 billion. Vietnam far exceeded its 2013 FDI target of US$13 billion, registering a total of US$21.6 billion FDI inflows, up 54 percent from the previous year. Investment in the manufacturing sector alone reached US$16.6 billion, accounting for over 75 percent of total FDI inflows. The rise in FDI has also had a substantial impact on the nation’s exports. The Ministry of Planning and Investment (MPI) reports that exports by foreign companies made up two-thirds of the nation’s total export turnover in 2013, which isn’t surprising when you consider the size of the companies in question. Some foreign companies, such as LG, sell most of their goods to the increasingly affluent local market of over 90 million Vietnamese. Yet many more look to capitalize on the ASEAN nations’ geographical position and advantageous free trade agreements by exporting their goods to emerging markets, particularly China. Or, in the case of Samsung, exporting worldwide. Samsung singlehandedly made mobile phones and components the top export category for the first time last year. Total exports topped US$132 billion in 2013, of which Samsung accounted for around 16 percent. Vietnam’s General Statistics Office reported that the South Korean mobile phone behemoth accounted for an incredible 98 percent of the US$21.5 billion total for mobile phone and components exports. Mobile phone and components also experienced the highest growth of the export categories, registering an impressive 69 percent increase from the previous year. Vietnam’s exports have changed dramatically in recent years as a result of foreign firms. Back in 2009, mobile phone exports barely made the top 10, coming in at 9th place. Textiles, which has traditionally been Vietnam’s top export, was relegated to second place at US$17.8 billion last year. Computer and electronics witnessed the second highest growth (behind mobile phones) at 36 percent and took third place with US$10.6 billion in exports. In May last year, the government said that it considered the development of the electronics industry (comprising both the mobile phones and computer electronics categories) to be of great importance, and set a US$40 billion target for electronics in 2017. One primary reason for the influx of foreign investment into Vietnam is the government’s generous tax concessions and subsidies. The government is still in the process of further revising its laws to be more investment-friendly, particularly for high technology companies. The recently amended Investment Law, which is expected to be approved at the end of this year, extends investment incentives to the expansion of investment projects, when previously such incentives were limited to new projects only. Another example is the High Technology Law, which passed in 2009 and conferred special benefits to investors running high-technology projects. However, the conditions that need to be satisfied before something qualifies as being a “high technology project” have been criticized for being overly stringent, with Samsung, Intel and Nokia falling short of the stipulated requirements. The government has acknowledged there are matters in the High Technology Law that need to be resolved, though when these amendments will be made is unclear. In the meantime, larger companies are simply obtaining directly negotiated benefits from the government. Samsung is a clear example — one of its factories has not had to pay tax for the first four years of operation and will get a 50 percent tax break for the following 12 years, while its other three facilities will have their land rentals reduced by 50 percent. Samsung admitted that its decision to make a long-term investment in Vietnam was partly based on the government and provincial administration’s support. Vietnam’s competitive labor costs are another oft-cited reason for companies migrating their manufacturing operations to the country. 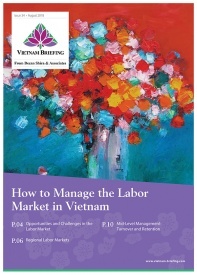 The minimum wage in Vietnam is between VND1,900,000 to 2,700,000 (US$90 to US$129) depending on the region. With China’s economic shift from manufacturing to services, wages in the Middle Kingdom have increased and factory workers in China are paid about three times what those in Vietnam are paid. Yet the focus for high-tech firms is not simply the cost of labor, but also the quality. “Compared with other countries, the workers here are smarter, abler and more energetic. They are young and skilled and the labor cost is reasonable,” said Ko Tae Yeon, general director of LG Electronics Vietnam. Kim Yong Seok, planning director for Samsung’s complex, similarly explained that the labor cost was just one factor in the company’s decision to invest in Vietnam, citing the workmanship of Vietnamese workers as the more important reason. The large multinationals are already changing the landscape of Vietnam’s labor market, providing a source of employment for thousands of workers. LG estimated its facility would create about 20,000 jobs in the region, while Samsung estimates its plants already provide work for 24,000 people and have indirectly created work for about 50,000 more. However, while Vietnam’s workers may be affordable and meet high workmanship standards, the nation still has a shortage of highly-trained information technology workers. Last July, the official Vietnam News estimated that the country would need over 400,000 such workers through 2018, while producing only 60,000 each year. Companies like Intel and Siemens are funding engineering classes and helping to train workers so that they have the knowledge and skill sets needed to work in more technical roles. The general manager of Intel’s Vietnam factory, Sherry Boger, noted that they had seen a “significant improvement” in the quality of the workforce. Though Vietnam’s workforce is becoming increasingly educated and skilled, the World Bank estimated it could take a generation to create a highly skilled workforce, and there is a long way to go yet. The government hopes that, in the long run, the investments of high-tech firms will equip domestic workers with skills and the technological knowhow to help the country modernize and eventually enable local businesses to become more competitive on the global stage. Another challenge currently faced by technology manufacturing companies in Vietnam is the lack of supporting industry. Many businesses have had difficulty sourcing required components in Vietnam, and the need to import parts offsets to some degree the labor cost savings of operating in Vietnam compared to China. Samsung is one company that has revealed it imports most of its parts and components from China because no companies supplied them in Vietnam. A survey by the Japan External Trade Organisation (JETRO) found that the localization rate of parts and components in China and Thailand is around 50 to 60 percent, while Vietnam’s was only 30 percent. Much of this is because the supporting industry has not yet caught up to the rapid increase in FDI in recent years. While it can be expected to improve in the future as satellite companies flock to meet this demand in Vietnam, change is happening gradually and many opportunities remain for domestic businesses to join these manufacturing giants’ supply chains. Vietnam’s economy is becoming increasingly dominated by foreign firms, particularly in the high-tech manufacturing sector as global heavyweights like Samsung, Intel and LG continue to expand their operations in the country. 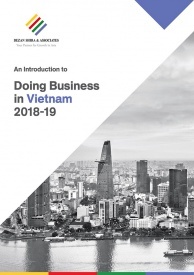 With foreign companies making significant contributions to the country’s total exports and GDP, FDI has been instrumental to Vietnam’s growth in recent years. China is no longer the manufacturing mecca it once was due to rising wages, and international firms are looking to shift their manufacturing facilities to more cost-effective destinations. Vietnam’s geographic location, advantageous free trade agreements, and preferential government policies put it in a prime position to capitalize on those arising opportunities. 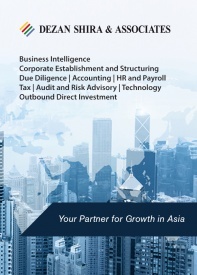 Dezan Shira & Associates is a specialist foreign direct investment practice, providing corporate establishment, business advisory, tax advisory and compliance, accounting, payroll, due diligence and financial review services to multinationals investing in emerging Asia. Since its establishment in 1992, the firm has grown into one of Asia’s most versatile full-service consultancies with operational offices across China, Hong Kong, India, Singapore and Vietnam as well as liaison offices in Italy and the United States. For further details or to contact the firm, please email vietnam@dezshira.com, visit www.dezshira.com, or download the company brochure. 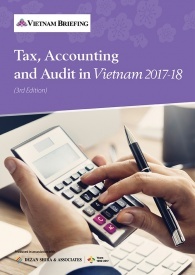 In this issue of Vietnam Briefing, we clarify the entire VAT process by taking you through an introduction as to what VAT is, who and what is liable, and how to pay it properly. We first take you through the basics of VAT in Vietnam before taking you deeper into the topic. Additionally, we provide updates on the new changes to the VAT process and explain how they will impact your business. 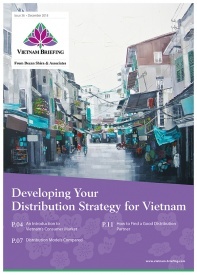 In this issue of Vietnam Briefing Magazine, we introduce our readers to manufacturing in Vietnam as a key part of their business strategy within the ASEAN region and beyond. Specifically, we explain the new ASEAN Free Trade Area, outline what foreign investors can look forward to when creating their manufacturing presence in the country, and introduce the country’s key tax points. 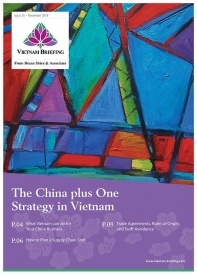 In this issue of Asia Briefing Magazine, we discuss why China is no longer the only solution for export-driven businesses, and how the evolution of trade in Asia is determining that locations such as Vietnam and India represent competitive alternatives. With that in mind, we examine the common purposes as well as the pros and cons of the various market entry vehicles available for foreign investors interested in Vietnam and India. We also examine the advantages of using Hong Kong and Singapore as corporate bases to reach out to Asia’s emerging markets. Finally, we comment on how the proposed Trans-Pacific Partnership will affect both China-based and Vietnam-based manufacturers.